Semester 2. | Almost Amazing Grace. I've spent almost every night this week snuggled in bed with a gorgeous friend watching How I Met Your Mother, eating chocolate brownies and jammy biscuits. I spent today having a Harry Potter marathon. I'm looking up train times and fares for a weekend away visiting friends in Birmingham. I'm putting off doing my laundry and wearing dirty clothes over and over again. I've filled up my top desk drawer with biscuits and chocolate. I've texted my mum a couple hundred times. I sign into Skype seconds after switching my computer on. My little sister has called me to discuss the latest episode of Desperate Housewives. I've spent a significant amount of my weekly allowance on fancy dress stuff. I've written a groceries list. I am constantly forgetting my Bag For Life when I go shopping. Going to bed before 3am is no longer an option. The lesbians upstairs are keeping me up all night with their noisy antics. A couple of friends and I have abused the local tattoo shop's "buy one get one free" offer on piercings. I'm buying my friend a 10-pack of Richmond Menthol and a bottle of Archers in exchange for her dyeing my hair in her sink. 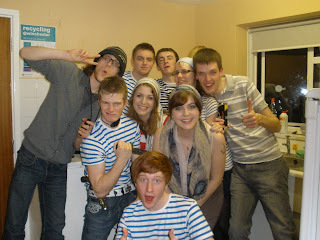 On Friday night I was a drunken pirate dancing the Macarena with some amazing people.